Telescope image of the stellar jet of HH 110, which is dramatically similar to the simulations. Astrophysicists no longer sit and idly wonder what happenswhen a powerful stellar jet from a young star collides with giant clouds of gasand dust. They first watch what happens hundreds of light years away, and thenrecreate the cosmic event with a multi-trillion-watt laser capable ofdelivering more power than exists in the entire U.S. power grid. A recent experiment did just that with the Omega laser atthe University of Rochester in New York, and then compared the lab results withboth computer models and telescope observations of a real-lifestellar jet. The study marked the first time that astrophysicists havecollected new astronomical data from a laboratory simulation. "Ours is the first study to investigate what happenswhen jets run into obstacles along their paths, and the first to have a strongenough laser to properly scale the shock waves in a jet to the astrophysicalcase," said Pat Hartigan, an astrophysicist at Rice University in Houston,Texas, and lead author of the new research. Experimental runs went like this: The football field-sizedOmega laser would fire for just millionths of a second at a small cylindricalcan called a Hohlraum. The vaporized can would send radiation slamming into apiece of titanium the size of a marble, and the titanium almost instantaneouslyheated into a plasma similar to what exists in stellar jets. The plasma wouldthen strike a tiny sphere of plastic embedded in foam, which stood in forinterstellar gas clouds. "Targets are literally the width of a dime," saidAdam Frank, an astrophysicist at the University of Rochester. "And then tohit the things with one of the most powerful lasers and not have it all turninto mush, that's what the target design was really pushing." Such laser-driven experiments have enabled astrophysiciststo simulate phenomena such as supernova blast waves in Earth labs. The Omegalaser at the University of Rochester's Laboratory for Laser Energeticsrepresents one of the top three lasers around. The most powerful lasers have only recently emerged at theNational Ignition Facility in California. There physicists hope to carry out"the ultimatelab experiment," in Frank's words, by triggering a thermonuclearfusion reaction similar to what takes place in the sun. But scientists looking to conduct smaller-scale experimentsmore than once a day can still flock to the Omega laser and its counterparts. "The thing about Omega is that it's incrediblyflexible," Frank told SPACE.com. "It can fire every hour orso." Even the most powerful laser experiments still fall short ofstellar jets that erupt outward from the poles of newly born stars at hundredsof miles per second. But Hartigan and Frank knew that they could compare theOmega laser experiment to real-life stellar jet collisions because ofmathematically equivalent ratios among the matter densities. In other words, the mathematics of stellar jets doesn'treally depend on the vast difference in physical size between a stellar jet andsuperheatedplasma in a lab, or between a gigantic interstellar cloud and a smallplastic sphere, Frank explained. The behavior of the two systems will be thesame as long as the density ratios are the same. The real-life comparison for the experiment came in the formof a stellar jet hundreds of light years away, named Herbig Haro 110. Hartigancollected fresh observations about the stellar jet by using a telescope at KittPeak National Observatory outside of Tucson, Arizona. Much of the experiment closely resembles how interstellarclouds and gas clumps can partially deflect stellar jets, but a few differencesemerged. The researchers found to their surprise that the experimental jet inthe lab burrowed into the plastic sphere and lifted entire pieces off, ratherthan simply vaporizing the target pieces. That lab finding helped explainobservations of how real-life stellar jets could drag along easily-destroyedmolecular hydrogen from clouds. "The new infrared images from Kitt Peak, when compared with existing Hubble Space Telescope images show this phenomenon quitewell," Hartigan said. "In our data the red is H2 (hydrogen) andclearly is along one side of the deflected flow, just like what we see in thelab." 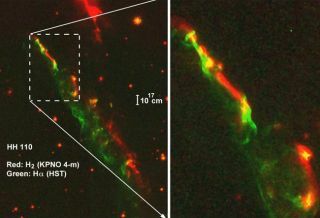 The most recent laser experiment replicated what mighthappen if a stellar jet impacts a giant interstellar cloud, but astrophysicistsalso want to know about the more common cases when jets run into smallergaseous clumps. Frank says that the smaller-scale collisions may explain whystellar jets don't look smooth like a garden hose, but instead appear morefragmented. Stellar jets might also simply emerge in that fragmented state fromyoung stars ? and that would touch on the mystery of why young starsconsistently create such jets. Stellar jets could even represent thermostats for stellarnurseries by regulatingstar birth. "Clouds that form stars are really pretty inefficientat turning mass into stars," Frank noted. "Maybe something like thefeedback from many jets running into each other or their environment keeps the cloudfrom collapsing on itself [and forming more stars]." For now, the researchers have scheduled Feb. 26, 2010 astheir next big date with the Omega laser. "We have an ongoing project to study how shock waves[from stellar jets] behave when they pass through clumpy environments, ashappens in real astrophysical situations," Hartigan said.